Don’t worry, you’re not alone. Most agencies (unfortunately) operate like this. They become so bogged down with client work that’s actually paying the bills that they forget to spend quality time promoting their own agency. But let’s be honest. Many a tomorrow has come and gone and you still haven’t started promoting your agency, right? This tomorrow logic almost never pans out. While this behavior might not pose a challenge right away—after all, if you have enough projects and clients keeping you busy and paying the bills, what’s the harm, right?—this strategy is definitely not growth-minded if expansion is on your radar (and it should be). This can also be a very risky strategy in general: If you run out of client work or one of your best clients drops, your agency will be left scrambling for work. If this happens too suddenly or is too much of a financial hit, you’ll become desperate for work, which is a point you don’t want to reach. Or maybe your agency just can’t self-promote properly due to the sheer financial investment to do so. If your agency is in any of these predicaments, luckily, today’s article should help. We’ll show you how to promote your agency when both time and funding are limited. If you don’t carve out time to promote your agency, it will never get done. But when your schedule is jam-packed, this is usually the first thing to be dropped from your to-do list. To counteract this effect, commit to spending one hour per day on your promotion strategy until you create a habit. This is enough time to make incremental progress every day, yet, you’re not losing large chunks of time away from client work to do so. For your first hour, start by creating a strategy. Don’t fret if this already sounds intimidating. Instead, use our next four steps as your handy guide. Content marketing offers that work while you sleep appeal: It’s always available for your customers and it gives them the feeling that you’re right there with them 24/7. It’s also a great way for you to show potential clients what your agency is all about. And they can research this on their own time, which is perfect for both of you. The problem is, it definitely requires more time from you and your team. So start with a content marketing plan and schedule to help keep your team on track and the tasks more manageable. Begin by answering the most common questions your current or prospective customers have. Are they looking for more information about implementing a parallax design, but are unsure of what exactly that entails? Or do they want to know what the latest web design practices are to see if their website is still up-to-date? Whatever the case may be, generate a list of topics and subsequent content around these specific concerns. Now, this doesn’t mean you have to sit down to write a blog article every week. If that’s not your speciality, don’t waste your energy on that route since it may take more of your time than necessary. Consider other options such as sharing your thoughts on a podcast or taping a series of short videos to help your clients. These are all perfect (read: effective) forms of content marketing. Plus, by creating content that utilizes your agency’s specialties, you’ll spend less time on the task and still end up with a high-quality product that only proves you’re the right choice. This builds an enormous amount of trust in a potential client’s mind since they can see what your agency is truly capable of. Again, content marketing and promotion can be compared to exercise: You won’t see immediate results, but with consistent practice, you’ll start to see progress over time. That’s why it’s essential that you pair your content marketing efforts with building an audience both digitally and in-person. Get Social: Any time you create content, share it across all of your social media platforms. Start with a compelling blurb that matches each platform’s audience style. Your blurb should capture their attention and include why someone would benefit from clicking your link. From there, start networking online. With this route, you’re not just looking for leads; your focus should be on building online relationships and fostering a community atmosphere where you help your audience by sharing your expertise. As your audience grows, it’s important that you interact with them in a non-spammy or desperate way. If someone leaves you a comment, be sure to respond back with a genuine answer instead of a hard sell. These two steps are both focused on self-promotion without being blatant about it. 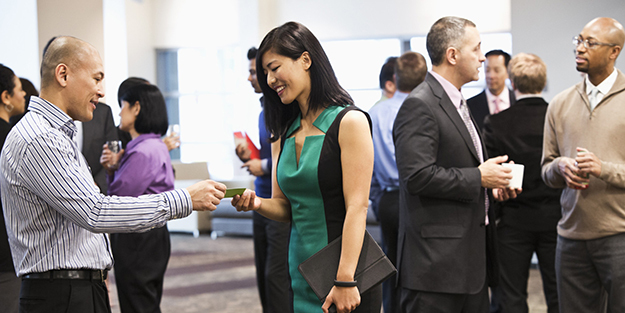 Keep Networking: Whether you’re connecting with people online via LinkedIn or you’re actually attending networking events, networking is still one of the best self-promotion strategies, especially when your budget is almost non-existent. Focus on building an authentic connection and rapport first instead of identifying everyone in the room as a possible prospect. Many people return from networking events feeling like it was a waste of time if they didn’t find a single lead—this couldn’t be further from the truth! If you walk away with a business card and a new connection, you’ve made commendable strides. See, these new connections may not be leads right now, or ever for that matter. But this could certainly change over time. Or maybe they know someone who is a better lead for you and will connect you two instead. You won’t know any of these possibilities until you establish the relationship. If someone’s not a good fit at the moment, send them to your website so they can see the helpful content you’ve created with them in mind. If they’re on the fence, your content marketing efforts may end up converting them. By capturing their email address, you can eventually promote to them later down the line and stay at the top of their mind when they need someone like your agency. As your audience grows, you’ll want to create a single piece of content, known as a lead magnet or opt-in offer, that delivers massive value to your subscribers. In return, your readers will only have to trade their contact information (name, company name, phone, or email, for example). This is the second step (the first one being creating consistent content) in creating a high-converting sales funnel. This is also the point where you’ll find out who’s really interested in what you have to offer. When subscribers provide their contact information, a smaller—yet targeted—audience starts to emerge. While this may not make self-promotion easier, it will certainly help you convert more. Once you’ve tackled the first four steps, you’re ready to move on to using paid ads. Up until this point, you’ve only had to invest your time and possibly a small monetary expense in the name of networking. Let’s really put that promotion budget of yours to good use with paid ads. In the early days of paid ads, search engines such as Google were the leading contenders. These days you can expand your reach by using social ads, which is a huge plus. This opens up your agency to a larger audience without increasing the cost to do so in most cases. You may find that using social ads is much more effective and cost efficient than traditional search engine ads such as Google. Plus, you’ll be driving technically cold—but highly targeted leads—to your site with paid ads. When these leads arrive, they’ll be greeted with your helpful content. As your new traffic reads your content, they’ll turn into warm leads. Some readers may convert on the spot while others may still need more convincing. This is exactly why your content marketing and lead magnet need to be done first. With a completed lead magnet, you’ll know how many of your new subscribers are interested in what you have to offer, making it easier to identify who to market to. On the flip side, if your content marketing isn’t up to speed, you’ll only be relying on those customers who convert right away, which may not be a whole lot to start with. Spend time exploring paid ads and get creative. Don’t forget to change up the ad copy and images to improve your click through rates. By focusing your attention on these strategies, you’ll create a promotion plan that carries on even when you’re not working at your desk. Initially this will only cost you an investment of your time. Once your content is rocking and rolling, you can turn some of your attention and promotion budget to paid ads. This way if your paid traffic is not ready to convert, they’ll have your consistent content as a helpful guide to look forward to in the meantime. The key to promoting your agency is starting with just one hour every day. Commit to this plan and promotion will never slip through the cracks of your growing to do list again.